We will look back at 2016 as the year where we've only scratched the surface of what hearable tech is capable of. Our Hearable of the Year the Bragi Dash finally delivered its long awaited truly wireless fitness tracking buds, Oakley's Radar Pace smartglasses included earphones for its real-time coaching and even Samsung and Apple decided to join the party. 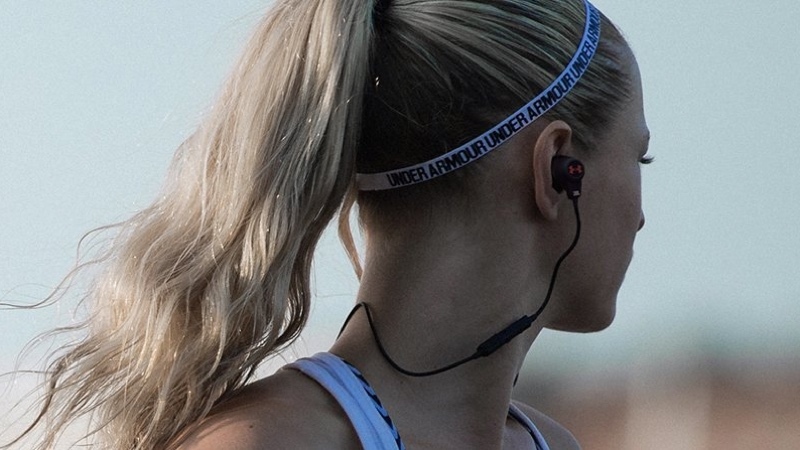 Harman is a company that's been making headphones for years and thanks to a partnership with Under Armour, it decided to enter the hearable space when sub-brand JBL and UA launched the Sport Wireless Heart Rate headphones. The heart rate monitoring in-ears work with UA's HealthBox platform letting you feed the biometric data into its Under Armour Record app. But this is not a simple exercise of slapping Under Armour's name on a pair of JBL sports headphones, there's a great deal more to the relationship between the two as Damon Johnson, global category manager for sports headphones and wearables at Harman, explained to Wareable. "The whole lock up between UA and JBL, it's a partnership that has been in discussion for about two years," Johnson told us. "It's fairly new so we are still navigating how things will work. But it really is a true partnership. In terms of what to look for from the partnership, UA has this super robust ecosystem with 175 million users. "We are not entirely privy to the full strategy, but we know they are making a big play into hardware. HealthBox was the first part of that. We know from our own research that 90% of all runners run with music. About 86% of people generally working out are working out with music. That's a necessary piece of kit and Under Armour realises that too." How did I fare in my target to run a 1:45 half marathon by heart rate? Dan Radin, a sport health and audio technologist at Harman, also explained how working closely with the sports apparel giant is opening doors for the audio company. It means they can make wearables that get the elite athlete seal of approval. "We went down to the University of North Carolina and tested our heart rate headphones with football players for a week," Radin told us. "What better access can you get than that? Harman doesn't get access like that. We are really learning about how to rigorously test our products." It's not all that surprising that a company that makes a lot of headphones decided to bring heart rate to the ears over any other place of the body. In the quest to move heart rate monitoring away from the chest strap, most wearable tech companies have gravitated to the wrist. But we're seeing a trend to take those BPM readings from higher up the body. Jabra has been doing it with its Pulse headphones and Sports Wearable of the Year winner Moov has just introduced its first heart rate monitoring wearable, which you wear inside a headband. The Harman team had their reasons for looking to the ears and not to the wrist. "It's one of the best spots of the body in terms of anatomy and getting that biometric data," Johnson explained. "We have that possibility of moving a piece of equipment away from an athlete, be that wrist based wearable or the chest strap." There's still clearly a lot of educating to be done in letting users know the benefits of taking heart rate measurements from the ear, when the current devices are still dominated by ones you wear on the wrist. It's something Johnson and Radin are all too aware of. "It's a challenge like there is with any new technology," said Johnson. "There's always going to be some degree of scepticism. Look what has happened with the wrist based wearable space in the last 24 months. Heart rate is now an assumed feature set in the wrist based wearable. Heart rate is going to be built into a lot of products that it wasn't previously inside. "We know we are not the first to launch a pair of headphones that can monitor heart rate monitoring, but we believe we have superior technology. That's down to the technology partners that we choose, the ergonomic design, and even to the sweat testing that we do. Yes there will be scepticism, but I believe that will be short lived." One of the biggest trends in the headphone and hearable space is removing the cable from the equation to give us wireless headphones that are actually wireless. Bragi arguably kickstarted the trend, but since then heavyweights such as Apple with its EarPods, Samsung and the Gear IconX and Jabra have embraced the move to ditch the cable. Harman hasn't followed suit just yet, but it has its reasons for not jumping in right now. "In terms of truly wireless, there's something that's a lot of buzz around," Radin told us. "I've not seen a lot of data to suggest that this is something that consumers want. It feels more to me that it's something marketing companies are pushing on people. If we do some research that says yes, athletes want truly wireless earbuds, then maybe we will consider it. We are always looking at other things and it's something we're discussing." While truly wireless buds is not part of the Harman or JBL setup right now, it's not ruling anything out and is excited by the close relationship it now has with Under Armour and how it can help them shape what they do next in the smart sports headphone space. "We are part of an ecosystem here," Johnson explained. "We are not just building another pair of sports headphones. The UA Record app is at the centre of everything. There's no way we are going to put accelerometers in the headphone and compete with the UA Band. That doesn't make any sense. "It's not just going to be about headphones. We've got some cool ideas on that roadmap and it all centres around the athlete experience. Paying close attention to the athlete, whether that's getting up in the morning and tracking sleep or tracking nutrition through a piece of hardware or going for a run. We couldn't be more thrilled to be partnering with them. They are the rock stars in this space."